This 100% natural eco-friendly formulation makes meltco™ Premium a very safe and effective de-icer. meltco™ Premium De-icer is a very friendly option for snow and ice melting around children, pets, softscapes, hardscapes, roofs and vegetation. It consists of naturally occurring complex trace minerals and micro nutrients in addition to the chloride family and MCi3. The MCi3 solution is formulated with CMA and organic elements extracted from sea water. Its natural ability along with minerals and micro nutrients buffers the effects of chlorides on vegetation and environment. 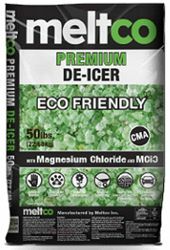 meltco™ Premium de-icer has no nitrogen or phosphorus added to make it an ideal option for de-icing around any body of water. Designed for faster melting and easier spreading at colder temperatures than typical ice melting products. The green biodegradable colorant added to the product minimizes the usage and increases its effectiveness.